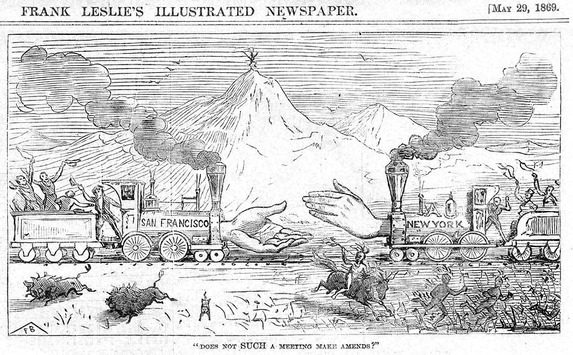 This cartoon from the May 29, 1869 issue of Frank Leslie's Illustrated Newspaper celebrates the completion of the Transcontinental Railroad linking the eastern and western halves of the United States, but its caption also hints at the hope for a deeper reconciliation. For a country just beginning to heal from the division of the Civil War, the railroad offered a symbol of renewed hopes for national unity. Source | Frank Bellew, "Does Not Such a Meeting Make Amends?," wood engraving, Frank Leslie's Illustrated Newspaper, 29 May 1869; from Central Pacific Railroad History Museum, http://www.cprr.org/Museum/Done!.htm. Cite This document | Unknown, “Frank Leslie's Illustrated Newspaper Celebrates a National Reunion,” HERB: Resources for Teachers, accessed April 20, 2019, https://herb.ashp.cuny.edu/items/show/644.